On the afternoon of April 11, 2019 local time, Premier Li Keqiang met in Dubrovnik with Prime Minister Edi Rama of Albania, who was here for the summit between China and Central and Eastern European Countries. Hailing the deep-rooted traditional friendship between China and Albania, Li Keqiang expressed that this year marks the 70th anniversary of the establishment of diplomatic relations between the two countries and that China-Albania relations are at an important stage of development. The Chinese side is willing to work with the Albanian side to consolidate friendly relations, promote practical cooperation, further elevate bilateral relations and better benefit the two peoples. Albania is welcome to expand its export of specialty agricultural products, such as honey, olive oil and wine, to China. China and Albania should enhance communication to reach an agreement on mutual exemption of visas between the two countries, facilitate youth exchanges and consolidate public support for the development of bilateral relations. 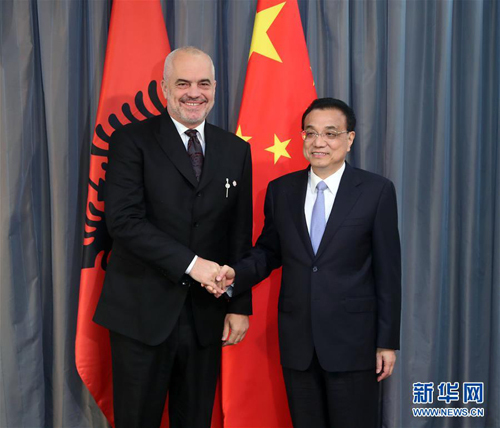 Edi Rama said that Albania and China maintain the traditional and friendly relations and this year we will hold a grand celebration for the 70th anniversary of the establishment of bilateral diplomatic relations. The Albanian side actively supports cooperation projects with the Chinese side, hopes to expand export of its specialty agricultural products to China, and expects that the Chinese side can provide convenience for more Albanian people to travel to China.